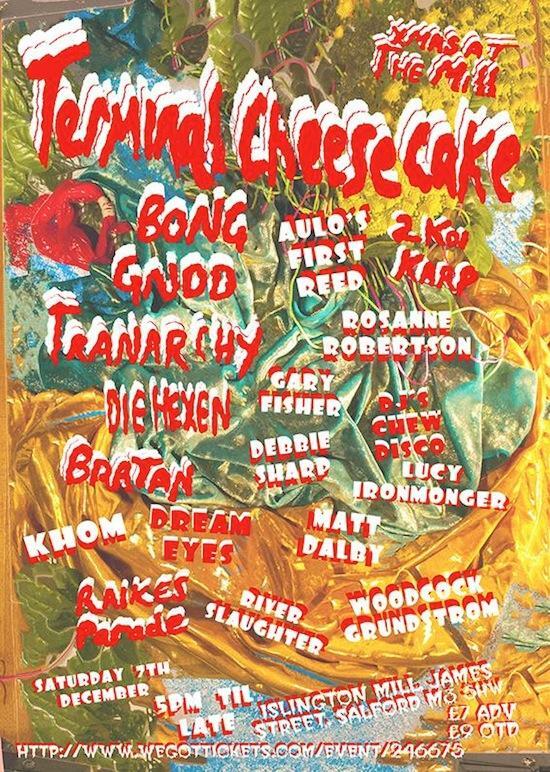 Terminal Cheesecake will be headlining a massive pre-Christmas bonanza of an all-dayer at Islington Mill in Salford on December 7. The reunited London psych outfit will be reanimating the spirit of their near-legendary mid-90s live shows, ably fronted by Neil Francis of Islington Mill residents Gnod, who'll be second on the event's bill. Elsewhere, there's prime doom from Bong, goth-tinged electronics from Die Hexen and Gnod-collaborating Manchester producer Raikes Parade, joined by Tranarchy, Bratan, Dream Eyes, River Slaughter, Rosanne Robertson, Debbie Sharp, Aulo's First Reed, Gary Fisher, Matt Dalby, 2 Koi Karp, DJ sets from Lucy Ironmonger & Chew Disco and Vulj and "visual stimulation" from Khom, Woodcock and Grundstrom and Mark O'Shea.